Measuring performance online: How can you evaluate online learning? Savings of € 20,000. - per year and € 1,500. - per participant;A course attendee who experiments with virtual tools in team collaboration and who contributes to shorter and more effective meetings in the organisation and contributes to cost savings in travelling;Satisfied participantsThree practical examples as a result of an evaluation of a 'blended learning' course at a training agency. One of the major challenges in online learning, is to visualize the development of a participant or organization. To what extent contributes online learning to improvement in efficiency? And to what extent does it contribute to improving the competence of the individual or the team in the organization? How can you monitor and evaluate online? 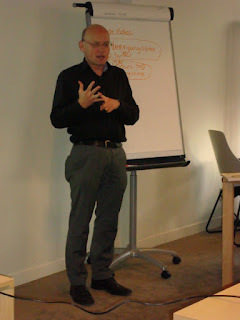 On the 21st June 2012 En Nu Online completed the first course 'Online facilitation with social media for organisational change and learning'. Over a period of eight months participants gained knowledge and skills on how to apply social media and virtual tools for organisational learning and change. Each participant applied lessons in a practical case in their work. One of the participants working with a big training company applied virtual exchange as part of a training about Leadership. Questions and practical assignments were disseminated through a Yammer group, where participants already were challenged to think about issues they encountered in their role as leaders. This experiment gained a lot of useful feedback for 'collective learning'. Both participants and the training company gained useful lessons.